Samford University soccer player Jermain Seoposenwe is on the South African soccer team competing at the Summer Olympics. Samford University senior soccer player Jermain Seoposenwe is attracting international attention as a member of the South Africa soccer team at the 2016 Summer Olympics in Rio de Janerio. Here is a story reported in South African media about her success. 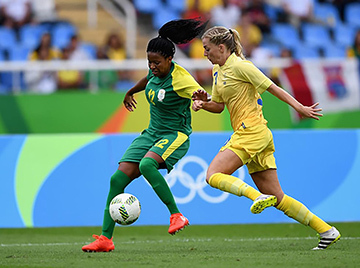 Brazil knows a "player" when they see one, so it was quite something when they took Banyana Banyana's twinkle-toed striker Jermain Seoposenwe into their hearts within a few touches. "When the crowd was shouting "Africa, Africa in the first half, it was just incredible," Seoposenwe smiled after the game. "They know their football, better than anyone in the world, so to hear them do that was pretty cool." " 'Numero Foza! Numero Foza! ', they beckoned to me at half-time, as I scurried for a water break. "It took a while to sink in, but they were acknowledging 'Number 12, Number 12!'." In the main stand, a clutch of South Africans ululated whenever 'Numero Foza' got on the ball. In snatches of time, it could have been Soweto, could even have been back on the streets on the outskirts of Cape Town, where Seoposenwe first caught the eye. "I used to play in the street with the boys, because I enjoyed the competition. I was this little girl, trying to muscle in, but it helped my skill. "Whenever I "shibobo-d" (nutmegged, for the diski uninformed) a boy, the game would stop and everyone would go crazy." There were flickers of that on Wednesday night, as she controlled Banyana's early tempo. "Whatever I do, it's for the team. As the striker, I have to hold up play, bring others in and just try to get on the scoresheet." That is one thing she's got accustomed to doing, both in national colours and in Samford University threads, where she is in the final year of a Marketing degree. "School comes first, man. My parents drilled that into me from day one, so I've just gotta finish and get my degree." Talk of the future had come on the back of the eyebrows she raised, especially in a country where women's football is a big deal. Almost as big a deal as America, where she has already made waves, as one of the top scorers in the college league. "Any club that would be interested must understand that education is my key. Once I'm done with school, then I'd love to see where the game can take me." For now, she's happy to do what she can to lead the line for South Africa, and try and keep them in the tournament. "We took some confidence out of this game, and we look forward to China." What she can be sure of is that the home crowd will be on her side, expecting to see more of the 'jogo bonita'. Like many commentators, though, locals are tongue-tied when it comes to saying her surname. "Oh, man! It's a daily struggle," she grinned. "My nickname used to be 'Microphone', because of my hair style and what I used to cover it with," she explained. Actually, she has a more appropriate diski name, but she would never dare call herself that. Not in Brazil. "My teammates call me Neymar," she whispered. "But there's no way I would say that here. Can you imagine?!" Funnily enough, it's completely imaginable. The only thing missing from completing the 'Neymar' is the numero 10, and perhaps a wacky hairdo. That hair is going nowhere, of course, and neither is "Numero Foza". Not until school's out, anyway.